Searching for top-of-the-line Jeep accessories in Northern California? Totally Trucks is your one-stop shop for quality truck and Jeep accessories. Since 1986, we’ve offered the best suspension accessories, truck bed-liners, towing equipment, and Jeep lift kits on the market. When you’re ready to get more out of your Jeep, there’s Totally Trucks. Browse our products online or visit our new showroom in Redding, CA. We’ve been providing quality automotive accessories for decades and are Northern California’s number one destination for custom car, truck, and Jeep accessories. Here at Totally Trucks, we take pride in our automotive knowledge. Not only can we help you build your dream Jeep, but we exclusively utilize parts made and manufactured in the United States. No matter what you’re looking for, we offer a variety of tools for upgrading your Jeep. Whether you just purchased a 2018 Jeep Wrangler or drive a classic Grand Wagoneer, our automotive experts can help you totally transform your vehicle. Suspension — While we offer a variety of truck accessories, we specialize in lifted applications. From legendary Jeep lift kits to busted suspensions, we can do it all. Our lift kits can help you turn your vehicle into the Jeep you’ve always wanted. 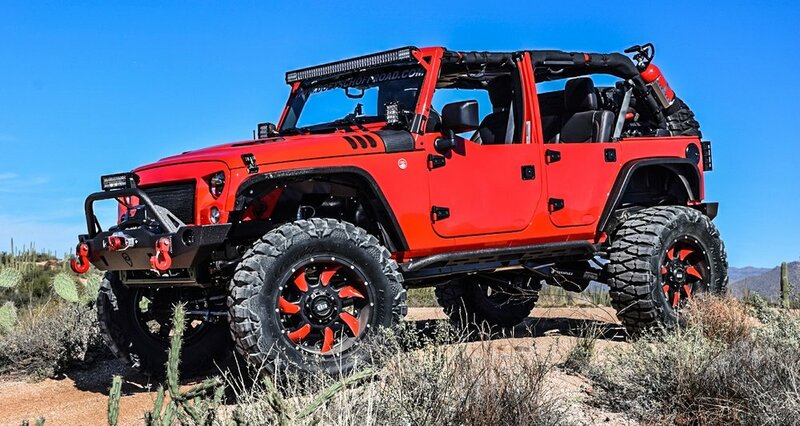 If you’re hoping to put some heavy-duty wheels on your Jeep for some mudding and off-roading, our suspension modifications can help you get there. In fact, they can help you take your Jeep almost anywhere. Additionally, we also offer lowering and leveling kits to balance your vehicle out to your liking. Towing — We can turn your truck or Jeep into the ultimate workhorse. If your vehicle is currently struggling with hauling products, Totally Trucks can help you tow extremely large hauls without sacrificing comfort and handling. We sell a wide variety of high quality towing products and accessories. Drivers come to Totally Trucks for towing mirrors, ball mounts, hitch steps, wiring adapters, brake controllers, hitch pins, and much more. You can rest assured we will improve your Jeep’s towing capabilities. Bed liners — Our selection of truck bed liners can help you achieve that classic look you’ve been searching for. We can also help you find something a little more modern. No matter what truck you have, we have a quality truck bed liner to suit your needs. Protect your truck and give it some appearance upgrades with our awesome liners. You bought a Jeep Wrangler because you aren’t like other drivers. That means you need a little more from your vehicle, and that’s where Totally Trucks enters the picture. As described above, we specialize in Jeep lift kits and suspension upgrades. Likewise, if your offroading and four-wheeling has left your suspension worse for wear, our service and repair department can diagnose and repair all manner of Jeep suspension problems. If you want to earn more about some of the custom installs we can provide on your Jeep, truck, commercial vehicle, or classic vehicle, give us a call today at 530-223-2246. You can also visit us in person at 3263 Bechelli Ln, Redding, CA, 96002. We’re open Monday through Friday from 8:00 a.m. to 5:30 p.m. and Saturday from 9:00 a.m. to 4:00 p.m.
Let's find out where you want to go and then we'll help you get there.